Rick had the opportunity to revisit his time writing for the web series Star Trek New Voyages at a presentation to the Gull Lake Rotary Club. The group had the chance to watch clips from the series, hear the history of Star Trek, and listen to Rick reminisce about his experience. Star Trek New Voyages ended its run in 2016, but you can still find episodes on YouTube, including "Mind-Sifter" and "The Holiest Thing." Fun fact: The studio in Upstate New York where the series was filmed is now a tourist attraction. RC&A is proud to announce our first-ever intern! Meet Sara Coppo, a student at Central Michigan University majoring in communications with a minor in journalism. When she's not deep into her studies or work, Sara is an outdoor person who also lavishes attention on Lua, a year-old golden retriever/labradoodle. She's preparing for her senior year by interning with us, assigned to United Way of the Battle Creek and Kalamazoo Region. Rick saw his first partial solar eclipse as a teenager in 1979. Eager to see a total eclipse, he was dismayed to learn that the next one over U.S. skies wouldn't happen for 38 years. But as WWMT Newschannel 3 reported, that long wait came to an end in August 2017. Double honors highlighted the first half of 2017 as RC&A received two awards from the Public Relations Society of America. The East Central District of PRSA named RC&A's "Building The Future Of Learning" campaign for Portage (Michigan) Public Schools as a Diamond Award winner. This campaign helped the school district earn voter approval of a $144 million millage to build new schools and athletic facilities. Meanwhile, RC&A was one of four winners of a PRoof Award from the West Michigan chapter of PRSA for communication support of the Help Now! Fund, which aided the victims and communities impacted by a 2016 mass shooting in Kalamazoo. We're honored to receive these awards! RC&A and videographer Jacob McGarry partnered on this powerful video in which residents of Jackson County, Michigan, read letters from people struggling in poverty. The video is part of United Way of Jackson County's focus on eliminating poverty and helping all people achieve financial stability. We're proud to have been part of this incredible production. With a great turnout of well-wishers at Studio Grill restaurant on March 15, RC&A's fifth birthday celebration brought in nearly 300 donated onesies. We dropped them off at YWCA Kalamazoo for use by the organization's clients with infants. We're proud to do something meaningful for our community and grateful for everyone who took part! We just turned five years old, and we're celebrating in a big way! RC&A is partnering with Studio Grill restaurant in downtown Kalamazoo to hold the Baby We’re 5 Onesies Drive on Wednesday, March 15, from 10 a.m. to 2 p.m. RC&A invites people to stop by, join the celebration and drop off a donation of newly purchased "onesies" undergarments for infants and toddlers. Donated onesies will go to YWCA Kalamazoo to be given to clients with infants. Among YWCA Kalamazoo’s programs are those assisting victims of assault and violence and providing quality care for children. Please join us and help celebrate while making a difference in our community! RC&A is proud to work with Hospital Hospitality House of Southwest Michigan on this new video, which explains the incredible impact HHH has on the loved ones of hospital patients. Take a moment to watch the video and hear these stories. You can also see a news report from WWMT Newschannel 3 at this link. Our thanks to ImageStream for their outstanding partnership. We had the privilege of working with United Way of Jackson County, Hunt Creative and ImageStream to produce this animated video for United Way's annual fundraising campaign. The video explains the tragic effects of poverty on individuals and families, and how "just one step" can make a difference. The viewer is invited to engage through giving, advocating and/or volunteering. It's a great message and a great opportunity for people to unite and change lives in meaningful ways. Rick Chambers & Associates received a Gold Award from the Public Relations Society of America's West Michigan chapter at the 2016 PRoof Awards. The award recognized RC&A's role in last year's community information campaign for the Portage Public Schools' $144 million bond proposals, which were passed with strong support by voters. Entries were judged by the Mid-Atlantic chapter of PRSA. On Feb. 20, a Kalamazoo area man randomly shot eight people, killing six. At RC&A, we offer our hearts, thoughts and prayers for the victims and their loved ones in the wake of this tragedy. Such violence does not represent the Kalamazoo community. We worked with volunteers Lily and Kailynn to randomly hand out $300 worth of gift cards for Cold Stone Creamery ice cream to pedestrians in downtown Kalamazoo. The message: Kalamazoo stands for love and support, not hatred and death. Our challenge to you is to show love and kindness to someone today. Another community focused effort by our friends at the Family Health Center of Kalamazoo. FHC employees are partnering with patients to train with Borgess Run Camp for one of the Borgess Runs later this spring. The effort includes covering costs for registration and running shoes through collaborations with Borgess Run Camp and Gazelle Sports. The Kalamazoo Gazette did a great story on the program, interviewing an FHC employee and a running buddy trying out shoes. Read the story here. The latest episode of Star Trek New Voyages has debuted. Written by our own Rick Chambers, "The Holiest Thing" tells the long-anticipated story of how Captain James T. Kirk (Brian Gross) met the love of his life, Dr. Carol Marcus (Jacy King). When a terraforming station explodes and kills 26 people, the crew of the starship Enterprise struggle to solve the mystery while facing a potential alien threat. "The Holiest Thing" takes place more than two decades before the Kirk/Marcus match-up that most Trek fans know, in the classic film Star Trek II:The Wrath of Khan (portrayed by William Shatner and Bibi Besch). "The Holiest Thing" is available for download at the Star Trek New Voyages website, or click on the photo to watch it on YouTube. Family Health Center of Kalamazoo unveiled a new mobile clinic at a news media event put together by RC&A. Local reporters and dignitaries showed up to tour the 40-foot-long, 300-square-foot rolling doctor's office. The new unit will serve students and families of the Kalamazoo Public Schools. Click on the links to see coverage from WWMT Newschannel 3, WXMI Fox 17, WMUK (NPR) West Southwest, and CW7's Lori Moore Show. Voters in Portage, Michigan, came out in strong support of two bond requests to fund two new middle schools, renovation of a third middle school, two new pool facilities, two athletic and performance facilities, and transportation and technology investments. RC&A supported the school district's information campaign, using an array of print, video, news media and online tools so that voters could make informed decisions. Read a news report about the community outreach here. Also, click here to see the outreach video produced in partnership with ImageStream Creative Communications. WLNS-TV 6 (Lansing) and morning host Mariah Harrison interviewed our client United Way of Jackson County's Beth Shafer (right) about the nonprofit's annual kickoff event: a cardboard boat race featuring more than dozen companies and groups. The community event, held Sept. 11, 2015, brings together hundreds of participants and spectators to celebrate the positive impact of United Way's work. You can see the video here. When the senior leaders of two major corporations get together to do something good for their community, it's a wonderful thing. And that's what happened in Kalamazoo when the executive teams at Stryker Corporation and Pfizer Inc. dedicated a day to helping out at Community Healing Center's STREET Program for at-risk teens. Execs toured the program's facility, assembled picnic tables, and basketball hoops, played games and served lunch. The service project, part of the Day of Caring effort by United Way of the Battle Creek and Kalamazoo Region, garnered good news media coverage through the efforts of RC&A. See the reports here and here. RC&A helped coordinate media coverage of Family Health Center's recent Back To School Bash. The event had an important underlying mission: making sure kids go back to school up to date on all their immunizations. More than 1,100 kids had been checked in the weeks leading up to the Bash. The Kalamazoo Gazette posted a lengthy feature on vaccinations in the wake of the Bash, and RC&A helped provide information, interviews and photo opportunities for the Family Health Center segment. Read the story here. News coverage on the new park appears here and here. Some 450 eighth graders from Comstock, Parchment, Galesburg-Augusta and Climax-Scotts came to Western Michigan University to gain insights on career opportunities available in southwest Michigan and the education that's needed to pursue them. Sixteen area businesses plus two WMU colleges took part. Students rotated through four 25-minute hands-on sessions based on interests such as health care, environmental sciences, aviation, education, journalism, law enforcement and manufacturing. Students also toured the campus to learn about life at a university. The day was capped with a presentation by Kinetic Affect. United 4 Change is a regional, business-led partnership promoting education, with a focus on early grade reading and career mentoring at the middle and high school levels. RC&A is proud to be part of this outstanding effort. Find out more at www.united-4-change.com. Rick Chambers & Associates received a PRoof Award for integrated communications from the West Michigan Public Relations Society of America at the 30th annual banquet in Grand Rapids. The award recognized RC&A for the #BeTheOneJackson campaign supporting United Way of Jackson County, "a highly visible integrated campaign that promoted the positive impact of United Way giving, engaged donors and helped drive the community to exceed the fundraising goal while setting the messaging stage for the future." We're honored to support United Way and its outstanding work in the community! More than 50,000 pets spayed or neutered since 2002 through Operation Fix-It. Up to 60,000 pounds of pet food provided yearly through KHS's emergency food bank. That's 500 pets fed every day. Sheltering of pets of domestic violence victims so people can get out of an unsafe situation. And there's lots more to discover about the Kalamazoo Humane Society at www.kazoohumane.org. United 4 Change, a regional partnership involving businesses, educators, nonprofits and volunteers promoting education, was featured on a recent edition of "The Lori Moore Show." U4C is a hands-on approach targeting career mentoring among middle- and high-school students and reading for elementary students. The initiative is having tremendous success, and RC&A is proud to help spread the word. Click on the image to view the segment. Find out more about U4C at www.united-4-change.com. ONEplace, a management support organization for nonprofits, has added Rick Chambers & Associates to its elite list of consultants who have a proven track record of delivering results for nonprofit clients. Earning a spot on the ONEplace directory involves passing a rigorous vetting process that includes demonstrated ethical standards and positive feedback from clients. See the directory here. Since its launch in October, Project Home For The Holidays has placed 35 households in permanent, stable housing—people who expected to be homeless over the holiday season. This milestone was made possible by generous supporters from across greater Kalamazoo who have given $85,923 to the effort so far. Listen to an interview on WKZO's "The Wayne Powers Show" with Executive Director Michelle Davis, who talks about the process of finding permanent housing. Click here for the interview. Examples of news coverage can be found here and here. The 2014 official campaign video for United Way of Jackson County, titled "Pictures," is now being used to highlight the great work of United Way and its community partners in Jackson, Michigan. The video was produced by RC&A and our partners at ImageStream. You can see the short video by clicking on the image or click here. An annual community event sponsored by the Family Health Center of Kalamazoo also has a health benefit: to ensure kids' immunizations are up to date before school begins. Click here to see a report by WWMT-TV Newschannel 3. Comstock High School teacher Alison Nord and student Jack Weir talk with WKZO Radio's Jim McKinney about their participation in the Junior Achievement Titan Challenge. The school's team beat out seven other U.S. and Canadian schools to win the national championship. 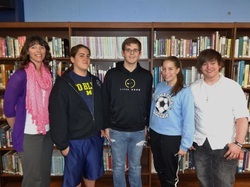 Listen to them share their story by clicking on the arrow below. 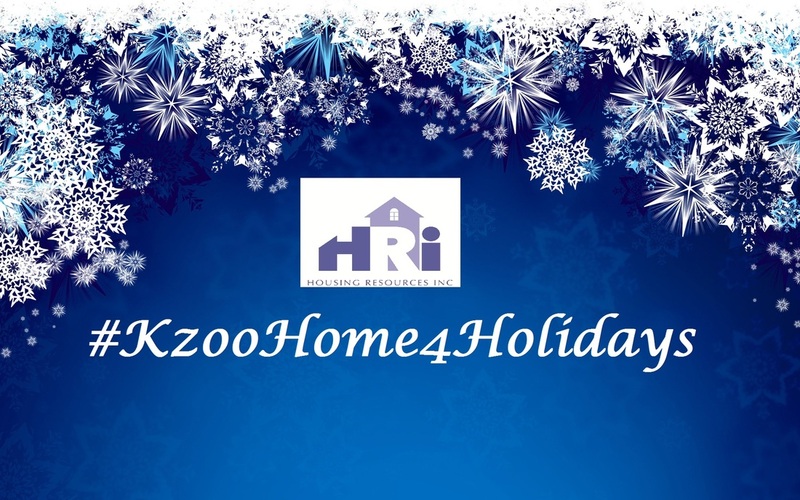 Michelle Davis, Executive Director of Housing Resources Inc., speaks on WKZO Radio's Jim McKinney Show on May 21 about HRI's participation in the Art Van Million Dollar Charity Challenge. To hear the interview, click on the arrow below. More than 550 high school students from across Calhoun County, Michigan, volunteered for dozens of projects as part of the annual Youth Day of Caring, sponsored by United Way of the Battle Creek and Kalamazoo Region and HandsOn Battle Creek. To listen to an interview with HandsOn Battle Creek's Abby Lumbard on WBCK-FM, click on the arrow below. You can also see a brief report on WWMT-TV Newschannel 3 by clicking here. Health care workers are hoping to get patients in shape one step at a time. Twenty employees from the Family Health Center in Kalamazoo are training for the Borgess run, which is part of the big Kalamazoo Marathon event. For the full story on why the participants are involved and how it's changed their lives, click here. We're always pleased to get some well-deserved media attention for our clients. This time it's about National Volunteer Month and ways for people to get involved. Click here to see spokespersons from Volunteer Kalamazoo and the United Way of the Battle Creek and Kalamazoo Region (which includes HandsOn Battle Creek and United 4 Change) talk with WWMT Newschannel 3's Jessica Harthorn about great volunteer opportunities in southwest Michigan. March is National Reading Month and area schools are getting kids excited about reading. In this report, Jennifer Nottingham, associate director of community impact at the United Way of the Battle Creek and Kalamazoo Region discusses an outstanding program that has had great success in elementary schools in west Michigan. KALAMAZOO, Mich. – For nearly nine years, scientists in a lab on Western Michigan University's campus have been on the hunt for a better, safer way to kill bugs, and they have apparently found it in one of Mother Nature's most efficient exterminators: the spider. Read more about Vestaron's breakthrough research here. 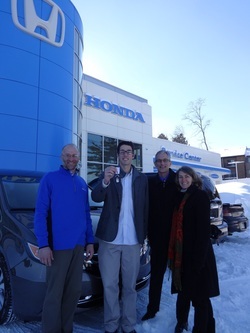 KALAMAZOO, Mich. – When last we checked in with Matt Stinson, he was tooling around the ice at Wings Stadium in a new car, celebrating his win in the 2013 United Way Sweepstakes. Six weeks later, he handed the keys over to his parents. And therein lies a tale of a family that cares. KALAMAZOO, Mich. – Preventative care is often the last thing on the minds of uninsured and low-income residents in Kalamazoo County who rely on the Family Health Center as their primary and often only source of healthcare. "It's not uncommon for our patients to come in with full-blown cancer or full-blown cardiac arrest," says Denise Crawford, president and chief executive officer of Family Health Center Inc. "We are trying to educate the population we serve about the importance of preventative care and address the issue so that they know the benefit of coming in for an office visit, which may cost $50, versus a $70,000 bill for open-heart surgery." JACKSON, MI – Jackson area business leader Bernard Levy believes it takes more than a school district to educate students; it takes a community. 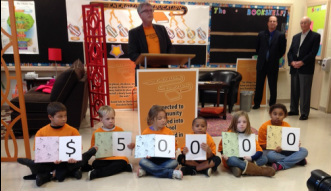 That’s one reason why he donated $25,000 to support the expansion of the Energizing Education literacy program, aimed at helping elementary students improve their literacy skills. In addition, Industrial Steel Treating announced it would match Levy’s contribution with an additional $25,000 next year. Levy is the former president of the company. He presented the gift to the United Way of Jackson County Tuesday, Oct. 29, at Jackson’s Frost Elementary School where the pilot program started in January. For more on this amazing donation, click here. "That's what being an entrepreneur is all about -- having the courage to go where most people would say you're nuts, in the simplest sense," Michigan Gov. 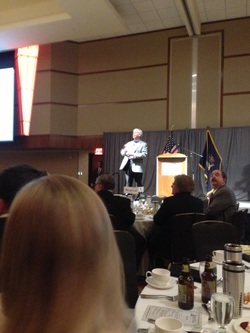 Rick Snyder told about 250 business people, scientists and others. 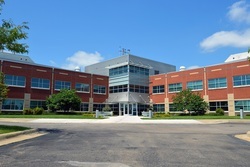 The occasion was the 10th anniversary of the Southwest Michigan Innovation Center. We're thrilled to be named among the best public relations firms in west Michigan by MIBiz Magazine. See the list by clicking here. A new video produced for United Way of Jackson County showcases some of the great community work being done by the organization. The video, created by Rick Chambers & Associates and ImageStream Creative Communications, is based upon a similar production by ImageStream for United Way of the Battle Creek and Kalamazoo Region. To view the video, titled "Thirty Thousand Sunrises," click here. Abraxas, a Michigan-based records and information management company, continues to demonstrate its "Giving Back" philosophy with this latest effort: a partnership with businesses to generate food donations as part of Community Hunger Awareness Month. Abraxas and Kalamazoo Loaves & Fishes spearheaded the effort, which also prompted resolutions by the City of Kalamazoo, the City of Portage and Kalamazoo County. Abraxas also is invited individuals to drop off donated food at its Portage facility as well as Gordon Food Services locations in Kalamazoo and Portage. 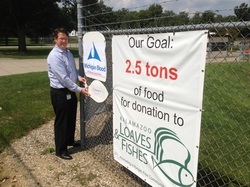 Abraxas employees are chipping in as well, plus participating in "lunch and learn" workshops on hunger. Typically, August is the toughest month to generate support for food banks. www.abraxasworldwide.com. 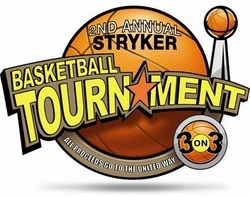 WKZO Radio (AM 590 Kalamazoo) interviews Amy McClain, community engagement and events manager for Stryker Corp., on the second-annual Stryker 3-on-3 employee basketball tournament, which raises funds for the United Way of the Battle Creek and Kalamazoo Region. Among the players: Stryker CEO Kevin Lobo and several members of the company's Executive Leadership Team. Like a child seeing a magic trick for the first time, a smile stretches broadly across Ben Wolf's face as smoke from a liter of liquid nitrogen thickens, rolls out of a laboratory sink and down a bank of cabinets. In this scenario, Wolf is creating his own magic, discarding a chemical use to freeze and then pulverize an animal tissue sample that he needed to test. "We usually let it evaporate on the lab table," said Wolf of the liquid nitrogen. 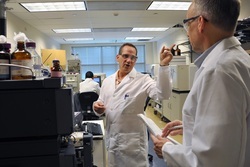 But he could not resist showing off a very surface-level byproduct of some of the research and discovery work that happens at the Southwest Michigan Innovation Center. SMIC President and CEO Robert DeWit, Ph.D., highlights 10 years of accomplishments at the Southwest Michigan Innovation Center in this reflective and forward-looking article in the Spring 2013 edition of BioMatters Magazine. You can download the file below, or go to www.michbio.org. 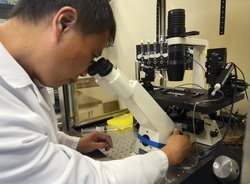 Metabolic Solutions Development Co. has recently published a study that shows its new approach for a potential diabetes treatment re-establishes normal metabolism in cells and reduces insulin resistance. Data suggests MSDC has found the molecular sensor switch that coordinates carbohydrate, lipid, and amino acid metabolism with cell function. 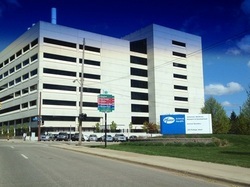 MSDC is located at the Southwest Michigan Innovation Center. James Bailey of the Family Health Center of Kalamazoo spoke to WWMT Newschannel 3 (CBS) about an initiative in which FHC employees received a specially designed coat from The Empowerment Plan and were charged to find a homeless person who could use it. The effort makes a community need real and personal to the employee while making the life of the homeless person a little brighter. Employees of records and information management firm Abraxas in Portage, Mich., spent a chilly Saturday morning tying 6,469 blue ribbons on a fence -- the number of child abuse and neglect cases reported in Kalamazoo County in 2012. As part of its Giving Back Program, Abraxas is doing its part to raise awareness of the issue. 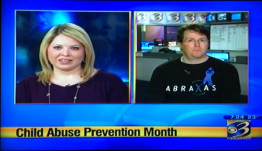 Learn more in an interview by WWMT Newschannel 3 (CBS) with Abraxas Community Outreach Marketing Manager Mac Ward by clicking here. The one-year anniversary celebration of Rick Chambers & Associates, LLC, netted 262 new underwear items for donation to the Kalamazoo Gospel Mission, a homeless shelter in Kalamazoo, Mich. The RC&A Underwear Bash, held March 14 at Old Dog Tavern in downtown Kalamazoo, was a community-focused way to celebrate the public relations firm’s first birthday, said owner and president Rick Chambers. Chambers said he hoped to make the Bash an annual event. A $1.4 million grant from the W.K. Kellogg Foundation will fund a three-year initiative to address social issues in the Cereal City. 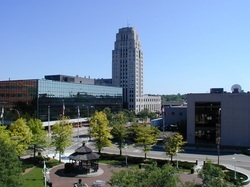 A collaboration of grassroots and community leaders, working with the Harwood Institute for Public Innovation and the United Way of the Battle Creek and Kalamazoo Region, will work to make Battle Creek the nation's first Beacon Community for social change. Read more on this announcement here. Rick Chambers, who worked for Pfizer and its predecessor companies in Kalamazoo County for 25 years before retiring in 2011 as director of external affairs and communications, said the spinoff of Zoetis appears to be a good thing for Kalamazoo County. “In my view, the launch of Zoetis is a great outcome for the animal health industry and for Southwest Michigan,” said Chambers, who is now president of Rick Chambers & Associates LLC, a communications and media relations company. For more on the spinoff and Rick's view, click here. It just got easier for scientists to strike out on their own in Kalamazoo. The Southwest Michigan Innovation Center on Tuesday, Nov. 13, unveiled its new core wet lab, complete with centrifuges, nitrogen generators, autoclaves, incubators and mass spectrometers. Too many entrepreneurs don't have the means to test their ideas--and that's where a Kalamazoo lab comes in. For video, click here.